I hate the promise of tomorrows. Ask Macbeth. Someone knocked at the door. Rubbing my hands with a towel, I let the visitor in. He had a firm handshake and his eyes were dark. He moved to the bed to shake the hand hoisted from the naked torso. He chose my padded up chair. ‘Toss in one more,’ the roommate said tentatively. ‘I’ll do two by three,’ I said. Having pondered at the ceiling of our room for a considerable time, Sam opened the blue notebook he was carrying and scribbled something. He was known for chronicling life as it happened. My roommate winked. I measured out stuff for two cups of tea in a saucepan. That could be shared too; rationing was in force towards month ends. Without further warning, Sam closed his eyes and started singing. I was proud of my young breath. My heart flipped like a pebble at the harmony of syllables. Sam leaned towards my roommate and whispered conspiratorially. My roommate looked at me. I freed my wallet of its lone pride. ‘And Alpha to Omega!’ my roommate added chirpily. But I admit, every time I mourned the loss of my high denomination bill I also thought of something being scribbled restlessly somewhere on the earth. Art has to be supported at all costs. I really like this piece, Uma. Since I’ve started writing, I’ve discovered so many gifted writers, people who write for the sheer pleasure of it, “ars gratia artis,” so to speak. It comes from the heart. Those are the truly great works, IMO, the only kind of writing that really interests me. I am happy you like it, Helena; it is endorsement enough. Looking for people ‘who write for the sheer pleasure of it’ is akin to the proverbial hunt for the needle in the haystack. Sadly, a lot of us are merely competing for eyeballs. Uma, I love the jaunty and whimsical tone of this piece. A perfect example of sympathetic and good-natured humor. It is great that you appreciate the piece on different levels, NP. Thank you. That was real subtle humor, Umashankar. Really enjoyed the read and the ending was the icing on the cake. The story reminded me of a story ‘My Lost Dollar’, I had read a long back, though of course the similarity ends with both being humorous pieces and a lost dollar being at the center of it all. I am happy you could see the ‘subtle humour’. Crisp, witty and lucid. I have said this earlier that your stories are incredibly visual. Sam came alive jumping out of the prose. Thank you for appreciating, Alka. Incidentally, I didn’t file this piece in ‘stories’! Amazing alacrity with which the countenance, the mannerism and the mind of Sam have been captured here. I think I just saw a short meaningful video clip here Uma. Oh and how I am moved at reading whatever he writes in his book and the way you read and gasp for thoughts and ultimately write them down. Loved this one so much! Glad you saw the video, Amit. But I seem to have failed here somehow, I am not Sam! Sams are out there in the blogworld, waiting to unload. Yeah I did perfectly get it! !Hope they all succeed. Amen! 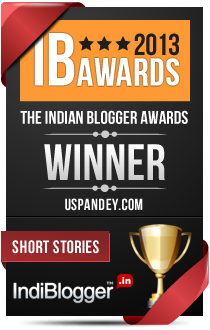 The fate of a fellow blogger US! What a character. Enjoyed following the story through, all the while wondering where it would lead me. ‘He made three misshapen omelets out of two oval eggs!’ – so good; & I did like the simple ending…perfect. Ian, you have pinned it to precision! Thank you. You are witty too, my friend. Love it … these hard-luck stories, that form a central feature of one’s wayward youth, never fail to strike a chord, at least with me. Reminded me of the Mike and Psmith stories written by PGW. Sam Narin is a classy character and the narrator a fabulous counterpoise. Thanks for your kind observation, Jayadev. Yet, it’s a far cry from PGW. I love that Sam was juxtaposed with a laughing club! Your entry was brilliant with “ask Macbeth.” I really did appreciate what Sam said about writing, and for what you did for him. Sometimes we don’t get repaid how we expect to. Charlene, thank you for noticing the juxtapostion with the laughter club as well as the allusion to Macbeth. You made my day! We all keep doing our bit for the Sams of this world but sadly, they remain blissfully ignorant of the truths. I see a glimpse of Sam in everyone around, little sad and little confused and still striving hard to move forward. Taking notes of the life every moment, as Sam does. Some like to write them down, people like me and you like to type them down and some keep them intact in the attic of their memories.. and there comes a point when we think that we got less than we deserved. loved the underlying humor and sheer simplicity of the purpose of writing. But that is not how your writing makes me feel. Dennis, that happens to be my favourite speech from Shakespeare too. I cannot even begin telling how it sums up my existence to me! Then there are times when it keeps me tethered to the earth. And I am sure it is relevant in this context too. What does the sound and fury of the legions masquerading as writers signify but nothing? Thank you for your precious input! Sam’s story,oval eggs giving birth to mis shapen omlets 🙂 , .. USP’s help and then the cloud watch, all inspires me to hang on …with what I am doing .. may be some day .. I will learn to do them best … and earn some bread too 🙂 After all…living life on own terms … is rather expensive !! Thanks for the inspiration and yet another amazing read !! First of all, many thanks for the lavish praise, Mysay -you are being kind. Your art has a fine streak of talent and I believe you can carve out a career out of it. You may come across both thorns and flowers in your path but then that is what life is! If I have managed to inspire you, I may have done at least one good job today. Carry on, dear cartoonist! Enjoyed the tongue-in-cheek subtle humour and the straight-talking lyrical. Finely balanced piece. Lovely! I am happy you enjoyed it all! Many thanks, Nilanjana. Are we running away with your story in the comments and giving it a different meaning 😀 But then i guess everything that is written will get interpreted. Enjoyed reading your piece. Mridula, maybe this post is like a mirror! Do I need to say more? True, Saru. I can see his projections everywhere. Wit, sarcasm, satire! Art needs to survive and for that we require rich patrons…you have hit the nail hard but the sound that reverberates is so musical. A bow to you Mr. Wordsmith!!! Sam is one such character who will always be in meaningful muse and a social parasite living on others. Aha! Its a well-sharpened edge that he possesses over others…the more gullible ones. The pretence and the knack of befooling others. Indeed! You always sweep me off my feet with each of your posts. I wonder what heights did the real Mr. Shyam attain in actual life? I will remain grateful for the lavish praise, Geetashree. You have captured the essence of this piece, as usual. I am not sure of the heights Mr Shyam attained in his life but I am very sure of the heights that measure up to him today. Really enjoyed reading the poignant story narrated in such a witty manner. Loved Sam’s writings. Writers always dream big but earn small. Poor Sam. You’re really awesome at short stories! Chaitanya, I am happy that the story of the overoptimistic writer touched you. Thank you for approving. And lest I forget, I love the paintings you put on your posts ! This is like a snapshot. A moment frozen in time. It’s pervasiveness is as touching as its timelessness. The old, old story… the battle between Saraswati and Lakshmi. Dagny, I am glad you approve of the snapshot, that moment frozen in time. This is what a writer would give his writing hand for. Many, many thanks. Congratulations. You have so many who care about your words. What an honour, Miss Molly! I feel blessed!! Alas poor Sam, I knew him, Umashankar: a fellow of infinite imagination 😉 A different kind of story but the character springs to life. We all knew him, Subroto! What about his benefactor? And how much more time before Sam caves in? This you have to ask of the Sams of this world! You should thank my parents for that, madam! ‘It is a tale told by an idiot, full of sound and fury, signifying nothing’ – that about sums up the entirety of my writing 🙂 Yours, however, are very evocative pieces touching upon various facets of living and brightened by a soupcon of humor as warranted. Great read as usual. It is simple post by a simpler scribbler, pseudomonaz. Wish you meet the best of the best out there! Thanks for those words. On another note, it takes an artist to recognise another. Here’s hoping nothing but the best will happen to all Sams (eventually at least). Very interesting post, USP. It gets us all thinking. Glad I forced the thinking cap, Divya! Mull over. That is generous of you, Corinne. Liked this short, simple and unpretentious tale that is bound to evoke thoughts. My personal experience with Sam Narin-s leads me to believe that they’re somewhat difficult to help. Sam-s can be appreciated, marveled at, empathized with, inspired, talked about – and even sponsored, and the world still remains quite imperfect for them. I can empathise with your thoughts. Many thanks for reading! It was all realistic until the last line! I wonder how much “yourself” you had input into Sam’s spiritual caricture. I really like it. It’s a nice mixture of sense of humor, compassion, and imagination. I am glad you like it so, Yun. There is some part of you in everyone. After all, we are all humans, aren’t we? This is wonderful. Made me laugh out loud! I hit the bull’s eye then, didn’t I?